It's spring, which means it's time to clean out those long neglected drawers full of junk. 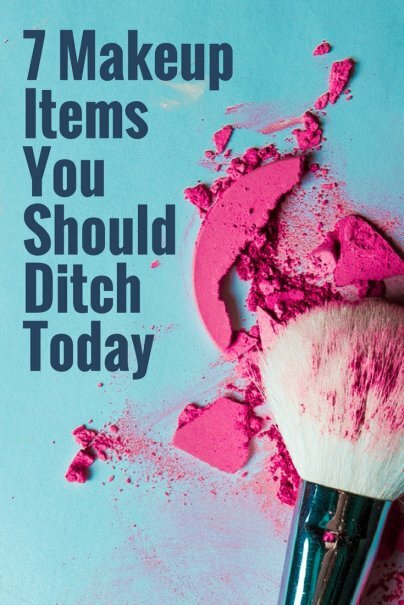 A great place to start is with your makeup drawer, because chances are you have a few things that need to be tossed. When going through beauty products, be sure to keep shelf life in mind as well as the impact on the environment and your health. For these reasons, the following seven products are an easy toss. If you've got tubes of mascara rolling around in your drawer that are more than four months old, toss them. Mascara is the cosmetic with the shortest shelf life, and chances are you've got one that is past its prime. Because it is used so close to the eye, it's a breeding ground for bacteria. You increase your chances of an eye infection or conjunctivitis by using old mascara, so switch it out with a new bottle every three to six months. The same rule applies to liquid eye liner. Take a look at your nail polish bottles and consider if they need to go. Are they several years old? Has the color separated? Is the texture lumpy? Toss them out. Then do a little research about the bottles you have left. Do they contain the "toxic trio" of chemicals? The trio includes formaldehyde, a known carcinogen, and DBP and toluene, two reproductive toxins. These chemicals have been banned in several other countries, but not in the U.S. A backlash led to many brands going toxic-free, but a recent study shows that a number of brands still contain the harmful chemicals. Make sure the polish in your drawer is, in fact, free of these three toxins. Many anti-aging skincare products boast alpha and beta hydroxy acids as key ingredients, and praise their ability to give a refreshed look to your skin. Unfortunately, these acids may be doing more harm than good. Products with these ingredients increase the skin's sensitivity to UV rays, contributing to skin damage and making us more susceptible to skin cancer. Alpha and beta hydroxy acids are now present in over 10% of moisturizers and, oddly enough, 6% of sunscreens. Check your products for these ingredients, and wear sun protection daily to reduce sun damage and keep your skin youthful. If you use sponges to apply foundation, concealer, or other products, then throw out used sponges at least once a week. If your sponges are of high quality, you can wash them weekly, but don't hold on to them for more than a few months. Anything that comes into contact with your skin on a regular basis is bound to grow bacteria, and could cause skin problems when used repeatedly. Eyeshadows and some pencils that are highly pigmented can contain aluminum powder, which the Environmental Working Group (EWG) has deemed a hazardous substance. The FDA has restricted its use, but only in lip products. Concerns linger over skin absorption and neurotoxicity, so better safe than sorry. Check the ingredients of your eye makeup and toss those that contain aluminum powder. Scrubs are a refreshing way to polish away dead skin and keep your face and body soft and smooth. But before you scrub up, check the ingredients. Plastic microbeads used in many scrubs are known to be terrible for the environment. Microbeads end up in lakes and oceans, and marine life cannot distinguish between the tiny plastic beads and food. Fish end up ingesting the plastics, along with any toxic chemicals they have absorbed. Many major companies have promised to stop using the beads, but warn that it will take several years to phase them out. Check your scrubs for plastic microbeads, and when purchasing opt for scrubs that use all-natural exfoliants. There has been a long, heated debate about whether lead in lipstick poses a threat to the wearer's health. The FDA has long claimed that the amounts are so small that they are perfectly safe to wear on a regular basis. Other groups have raised concerns over repeat exposure and its compounding effect. This issue is still being studied and discussed, but in the meantime, there are many lead-free lipsticks on the market. If your lipstick contains lead, you may want to consider trashing it, especially if you kiss your kids with that mouth. Do you have any of these iffy makeup products in your cosmetics drawer?